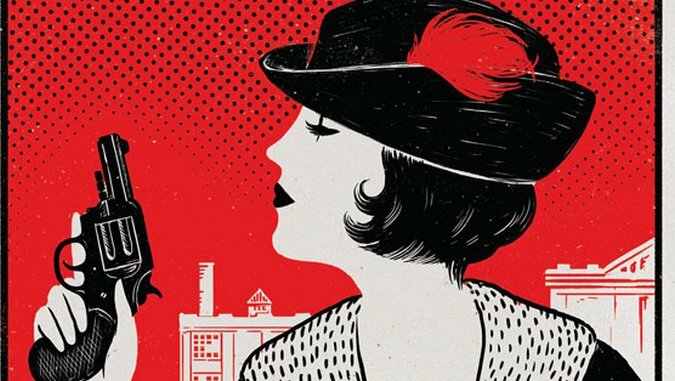 Like Fever, Mary Beth Keane’s fictionalized biography of Typhoid Mary Mallon, Amy Stewart’s Girl Waits with Gun tells the story of an iconoclastic early-20th-century woman without playing too fast and loose with the facts. But unlike the notorious and tragically ill-fated Typhoid Mary, Stewart’s protagonist Constance Kopp is largely unknown. With a title ripped straight from a 1914 newspaper headline, Girl Waits with Gun is billed as the hair-raising, violent adventures of one of America’s first female deputy sheriffs. In fact, Stewart’s book is effectively the prequel to that still-to-be-written book. 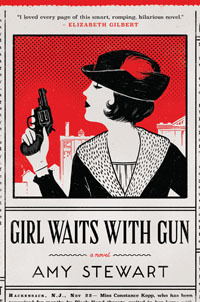 Girl Waits with Gun spins the alternately tense and rollicking tale of how New Jersey spinster Constance Kopp confronted the alarming lawlessness of a World War I-era silk mill town and won the job that earned her a footnote in history. Girl Waits with Gun begins with a scene reminiscent of Kenneth Grahame’s The Wind in the Willows, in which the ne’er-do-well heir to a substantial silk-dyeing fortune drunkenly crashes his early-model motorcar into a horse and buggy occupied by Constance Kopp and her two sisters, Norma and Fleurette. Henry Kaufman combines Mr. Toad’s devil-may-care impulsiveness and irresponsibility with a violent, vindictive, “I own this town” mean streak that puts him perpetually in conflict with the Bergen County sheriff and the more level-headed members of his family. When Constance Kopp seeks $50 as financial restitution for the damage to the family buggy, Kaufman goes on the offensive, initiating a reign of terror against the Kopp sisters that includes driving past their farmhouse late at night with his drinking buddies, shouting, shooting at them, throwing rocks through their windows, and once setting fire to their house. He also sends them Black Hand-style letters (signed “H.K. and Co.”) threatening to kidnap the youngest sister, Fleurette, and sell her into “white slavery” in Chicago. Complicating matters, Constance Kopp cuts a towering figure, demonstrating early on her physical superiority to Kaufman. Moreover, when she visits the silk mill to seek payment for buggy repairs, she encounters a young woman named Lucy Blake who claims to have borne Kaufman’s child during silk strikes a year earlier, only to have his associates abduct the child and hide him somewhere in New York. Meanwhile Constance strikes up an alliance with the local sheriff, Robert Heath, who provides the two older Kopp sisters with revolvers. Heath is increasingly impressed with Constance’s ingenuity in building the case against Kaufman in a town where he feels entitled to run amok. Stewart, author of six nonfiction books, has made a wise choice in telling the Kopp sisters’ story as fiction, because it allows her to deepen her characterizations of the three sisters to a degree that would have been much more difficult if she was forced into a strictly historical approach, given the limited sources available. Girl Waits with Gun doesn’t consistently sustain the violence and edgy tension the title suggests (arguably, Stewart might have done well to take a few more liberties with the story), but she effectively bridges the gap between the novel’s more dramatically charged scenes with the rich portrayal of three sharply contrasting sisters. The Kopps make a fascinating trio, already operating at odds with their times by choosing to manage their small farm and household without male supervision. Sixteen-year-old Fleurette, pretty and restless and flighty with a penchant for drama, revels in the monotony-breaking commotion of Kaufman’s harassment and the attention she’s getting as the target of a kidnapping threat. Norma, 31, reserved, anti-social, and against any plan to defend her family’s interests if it puts them at greater risk, seems happier among her trained pigeons than with people. Over Norma’s constant objections, 35-year-old Constance insists on fighting the Kaufman family at every turn, demanding payment for the damages to their buggy, bringing charges against Henry Kaufman for sending threats through the mail, and helping Lucy Blake recover her stolen child. The pursuit of Blake’s child provides many of Girl Waits with Gun’s most exciting and intriguing episodes, as well as Stewart’s most exciting invented scenes. Although Stewart says she found nothing in the historical record to indicate that Kaufman fathered an illegitimate child with a silk mill employee and took pains to hide the child and intimidate the mother, the invented subplot does much to illustrate the social dynamics of Paterson as a northeastern company town, as well as recounting some of the true-to-life consequences of the silk strikes of 1914. Sometimes at night, I stood at my window and looked out at the ice on the meadow and the barn roof and thought not just of Henry Kaufman and the torment he’d brought upon us, and Lucy, and who knows how many others, but of all the madness and malfeasance in the world beyond our rutted road. I understood the haunted look Sheriff Heath so often wore. To take a stand against it—to try to save one wronged girl or put a thief or murderer behind bars—would have been like trying to stop a locomotive with a patent leather bridle. I wondered what made the sheriff think he should even try. Another intriguing relationship in the book involves Constance and her brother Francis. The ongoing conflicts between the two illustrate a society in transition as a new century begins to define itself as a thing apart from the old one. From the very first pages of the book, Stewart establishes Francis’s discomfort with his sisters’ living arrangements, and his ongoing efforts to convince them to sell their family farm and move into his family’s house in the center of town, where he can ensure they’re properly looked after. Even as the Kopp sisters find themselves in the crosshairs of organized, violent extortionists, Francis continues his campaigns, suggesting that they would somehow be safer under his protection. If Constance espouses a gender-role modernity beyond her brother’s comprehension, in other respects, her brother positions himself as the modern one, having appointed his house entirely with new furniture, refusing anything that reflects their parents’ last-century immigrant world. It’s a fascinating juxtaposition that suggests the schizophrenic ways in which cultures struggle to grow up, and typifies how successfully Girl Waits with Gun mines the life of Constance Kopp and the fascinating, riveting, and almost-lost sliver of history that bears her stamp.